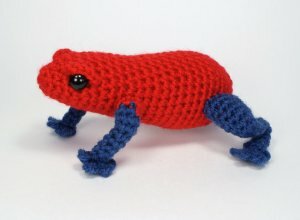 An original realistic crochet amigurumi Poison Dart Frog pattern by June Gilbank. This frog is based on the 'Blue Jeans' colour morph of the Strawberry Poison Dart frog (Dendrobates pumilio), a tiny tropical frog from the jungles of Central and South America. In real life, this little frog is only about 1" long, but the crocheted version is poison-free and a much more manageable size! Additional info: You'll also need 3 pipe cleaners to make the legs poseable. The ends of the pipe cleaners are protected, but please be sensible and don't use this as a baby toy unless you skip the pipe cleaners and stitch the legs into position instead. Date Added: 10/14/2018 by Beth M.
Date Added: 01/19/2016 by Heather L.
Date Added: 11/03/2013 by Angela N.
Date Added: 05/30/2012 by Erica A.